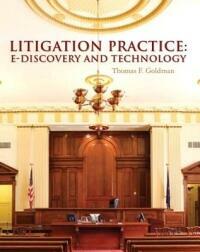 LITIGATION PRACTICE: E-DISCOVERY AND TECHNOLOGY is a thorough introduction to the latest techniques of electronic discovery ("e-discovery") and technology for use in civil cases from inception through trial. It offers extensive hands-on practice with several popular modern tools for office management, case management, discovery, graphic creation, and trial presentation. Each step and each category of tool is introduced through examples based on the fact pattern of a real case. A complete set of documents, reports, images, videos, and simulations are provided through the companion student site, MyLegalStudiesKit, and can be used to support student oral or multimedia presentations. The text's instruction, tools, and resources work together to teach core concepts that can be easily adapted to any software, civil case, or law firm.